Danish designer Thomas Bentzen combines traditional Scandinavian design with industrial references in his Enfold sideboard, created for Muuto. Launched during Milan design week, the storage design features sliding doors made from lacquered steel that has been punched and bent to achieve a ridged surface. The technique was used to create a design with, what the brand calls, a "graphical and modern expression". Inspired by factory buildings, Thomas Bentzen's wood and steel Enfold sideboard is designed to be both "industrial and homey"
"The Enfold sideboard came from the many factory visits that I do as a designer, prompting me to explore the aesthetic appeal of industrial objects," said Bentzen. "I wanted to translate this element into the modern home, combined with an appreciation of the Scandinavian design tradition," he added. 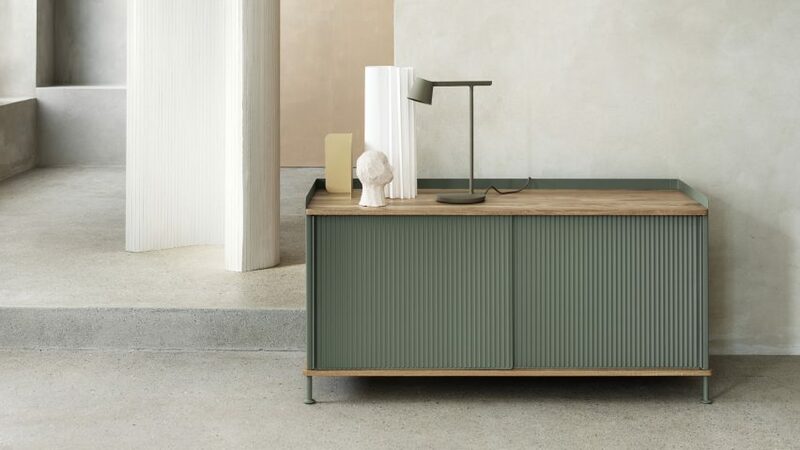 Copenhagen-based Bentzen chose to use warm-toned solid oak components to contrast with the sideboard's steel doors, while all screws and bolts are hidden from view to achieve a clean-lined finish. "The Enfold sideboard joins a warm touch of oak with a contemporary look of its ridged front, softening up the cold steel material and binding it together with the sideboard's oak components," said the designer. "The design is a new perspective on the traditional sideboard with an at once industrial and homey feeling, characterised by its unique duality of materials," he continued. Each of the steel elements of the Enfold sideboard are available in black, light grey, dusty green and sand yellow, while the wooden frame has been sealed with clear varnish for a natural finish. The sideboard is available in vertical and horizontal configurations, which both include a set of adjustable shelves. The vertical sideboard includes two shelves that can be placed across five different levels, while the horizontal sideboard has a single shelf that can be placed across three different levels. Muuto presented the sideboard along with a range of other recently launched products at the annual Milan design week, which took place from 17 to 22 April 2018. Other newly launched products include the Workshop coffee table by Cecilie Manz, two new versions of the Outline sofa by Anderssen & Voll and new colours of the brand's existing Unfold pendant lamp by Form Us With Love. The Enfold sideboard is not the first product that Bentzen has designed for Muuto. He also contributed a series of Loft Bar Stools to the brand's collection earlier this year in January. Back in December 2017, the Scandinavian brand was bought by US company Knoll, in a deal that aimed to see the company's business double within the next five years. According to a statement released by Knoll, the company purchased Muuto for around $300 million (approximately £223 million). Since then, the Scandinavian brand has also launched a range of Mimic Mirrors by French duo Normal Studio, which are designed to emulate the plastic mirrors typically found in Parisian barber shops.